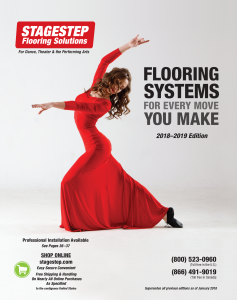 CMG Flooring is a certified Stagestep dance floor installer. They travel the United States providing professional flooring installation tailored to each studio. CMG Flooring can install your subfloor system, vinyl or wood flooring, ballet barres, and mirrors. • If temperature and humidity is not controlled 24/7 throughout the year. • Exposure to direct sunlight. • Exposure to water and moisture issues that include leaks and flooding. All tape installs are considered temporary and can last up to five years depending on type of tape installed. CMG Flooring is not responsible for resetting floor surface after install is accepted by the customer. Travel fee and expenses to be paid by customer for all follow up site visits. Ask for a custom installation quote directly from CMG Flooring. CMG Flooring is independently owned and operated, and they are entirely responsible for all aspects of your installation.